Pioneers in the industry, we offer single deck steel pallet from India. Being a well-established organization, we are engaged in manufacturing and supplying a distinguished range of Single Deck Steel Pallet to our clients. Our offered corrugated top is highly praised in different industries for loading of electronic products and other similar products. Appreciated for its remarkable features like fine finish and optimum durability, this corrugated top is highly praised by our customers. 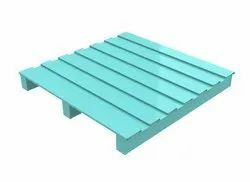 Further, this corrugated top is available in various sizes and designs as per clients' different demands.